You're giving a speech in front of an audience, and suddenly you realize that you're naked. Even if you've never experienced that particular nightmare, you've probably heard of it. Luckily, it will probably never happen to you in real life (and if it does, you work in a very interesting industry). But if your PowerPoint presentation goes wrong in front of a gathering of your peers--or worse, a gathering of your bosses--you have a real, waking nightmare on your hands. Here are solutions to six PowerPoint nightmares. The first two deal with problems that may arise when you're designing a presentation. The remaining four focus on avoiding disasters that you might otherwise not see until your audience saw them, too. These tips will help you save face when using either PowerPoint 2007 or PowerPoint 2010. Why doesn't PowerPoint handle pictures and text as well as Microsoft Word does? 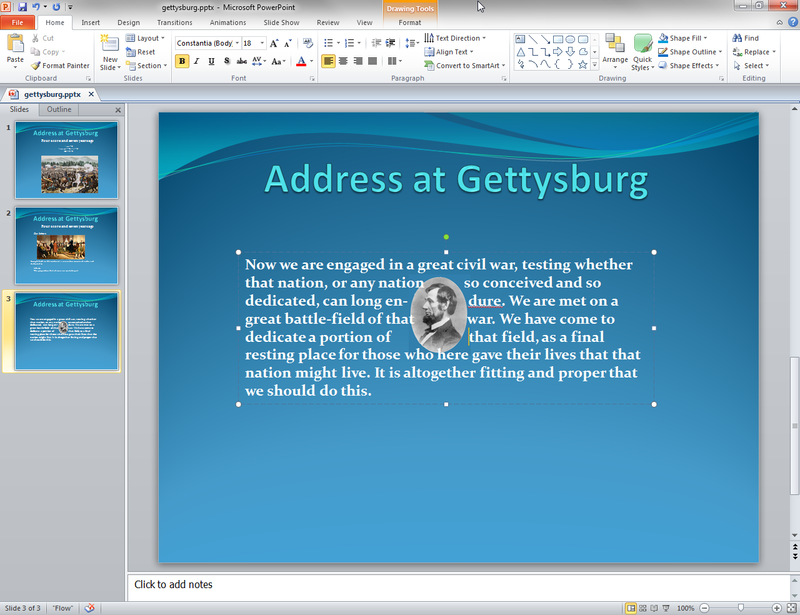 Wrapping text around an image in PowerPoint involves using your keyboard to insert letter spaces or tabs manually. If you want to put the image in the middle of an otherwise normal paragraph, you have to create a space for it manually: Place the text box and image on the same slide. Then move the picture into the middle of the text block and resize it to your liking. Right-click the picture and select Send to Back. Now, starting with the first line of text that overlaps the picture, insert spaces or tabs until the text surrounds but doesn’t block the picture. You've probably already guessed the problem with this solution: Any changes you make after adding all of the spaces will throw things off and require you to redo much of the work. If instead you want text to curve around an image, you can use WordArt. Select the text box, and click the ribbon's Drawing Tools/Format tab. Click Text Effects (if you don't see the words 'Text Effects', look for the softly glowing blue letter A). In the resulting pull-down menu, select Transform, and then choose the most promising shape. Move, resize, and reshape the circle by dragging it. 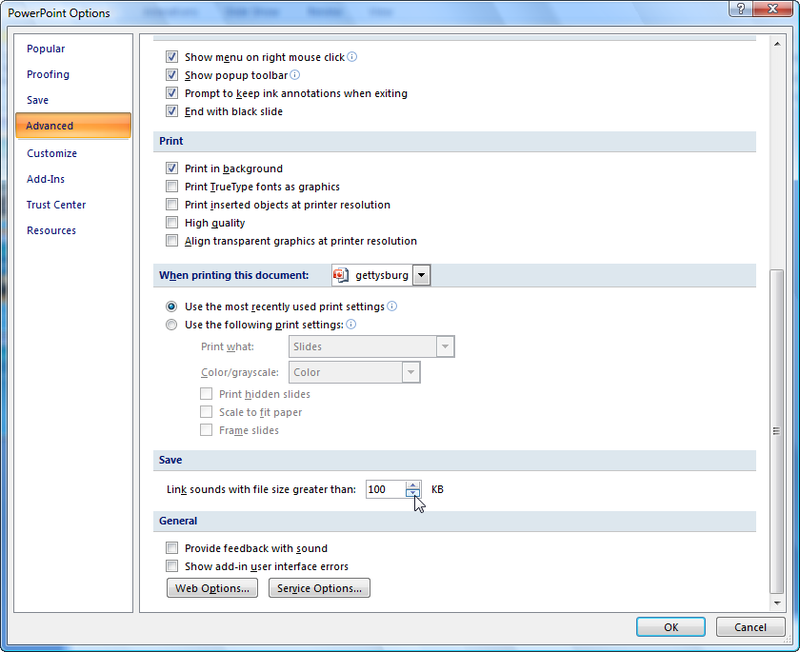 PowerPoint's Replace Font feature lets you correct a bad font decision throughout a presentation. Don't like the font that you (or a coworker) used throughout a lengthy presentation? Want to change it to something else? In the Home tab's Editing group, pull down the Replace menu and select Replace Fonts. Select the appropriate fonts and click Replace. You bring your presentation on a flash drive, plug it into your host's computer (connected to a projector), double-click the file--and get the fateful error message. You may have checked ahead to confirm that the host computer had PowerPoint loaded on it, but did you ask which version? The file format changed with PowerPoint 2007. To eliminate compatibility issues, set PowerPoint to save its files in an older format. The easiest way to avoid compatibility issues is to use the old file format. Your files will be significantly bigger, but you probably won't run into other problems. The owner of the computer can fix the problem by installing either the Microsoft Office Compatibility Pack for Word, Excel, and PowerPoint 2007 file formats or the PowerPoint Viewer 2007. Both are free. But that's their decision to make, not yours. Dave Paradi's Color Contrast Calculator doesn't look pretty, but it tells you what's wrong with your text-and-background color choices. Your slides can be completely legible in the office, but projected on the big screen they may be difficult for your audience to read. You can't assume that the projector you'll be using during the presentation will exactly replicate the colors on your monitor. Subtle--or not so subtle--differences in shade, brightness, and contrast are common. Of these four pairs, yellow text on a blue background is probably the most pleasing to the eye. White text on any truly dark color will also be readable. 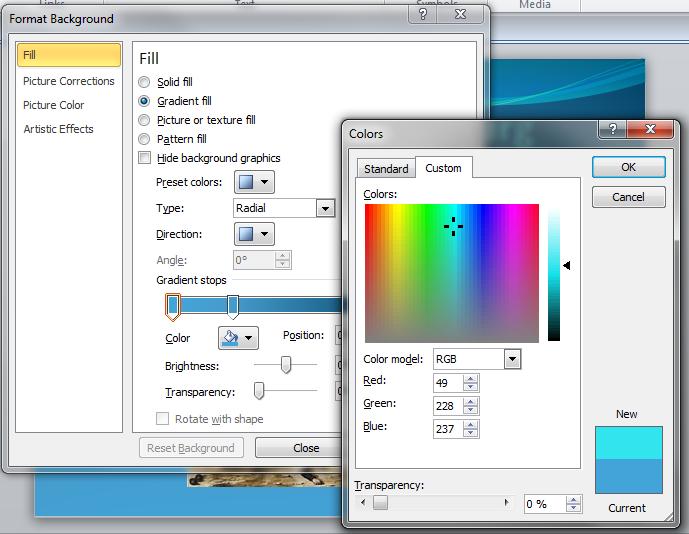 PowerPoint's Colors dialog box provides the numbers you need to use Dave Paradi's Color Contrast Calculator. If you want to experiment but ensure that your results will be readable, try Dave Paradi's Color Contrast Calculator. For a design tool, this Web page is surprisingly text-heavy and unfriendly, but it can tell you whether your two colors will produce legible results. For the text color, select some text and then click the Ribbon's Home tab. In the Font section, click the pull-down arrow by the color icon (an A with a thick, red underline) and select More Colors. You'll get the same dialog box. 5. That's Not the Font I Picked! To avoid presentation-time embarrassments, tell PowerPoint to embed your fonts. So you replaced an ugly-looking font with an attractive one (see problem #2 above), and then you got the colors right (see problem #4). But when you launched your presentation, the font onscreen wasn't the one you picked. Unless you're sure that you'll be running your presentation from your own laptop, you should embed your fonts to avoid font overrides from the host machine. 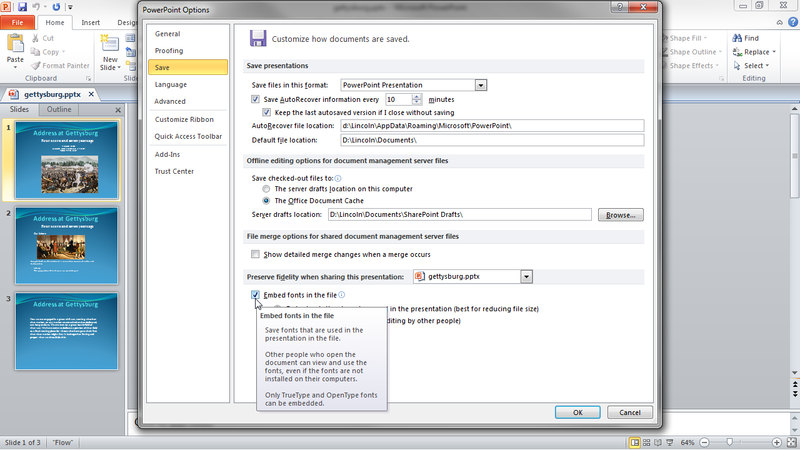 You can do the embedding from the PowerPoint Options dialog box. 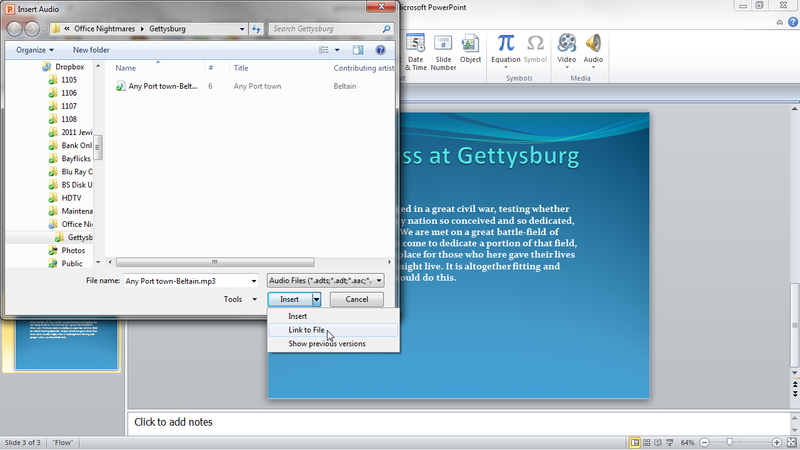 To get to that box in PowerPoint 2007, click first the Office orb and then the PowerPoint Options button. In 2010, click the Ribbon's File tab and then click Options in the left pane. Once you're in the dialog box, click Save the in left pane. Then check Embed fonts in the file. Fonts aren't the only components of your slideshow that may fail to follow your PowerPoint file to another PC. If you've added music or other audio to your presentation, it may play flawlessly on your computer, but elsewhere leave you with the sound of silence. First question: Does the presentation PC have speakers attached to it, and are they powerful enough to fill the room? If you have sound with your presentation, you need to answer this question in advance. You can tell PowerPoint 2007 to link, rather than embed, audio files that exceed a certain size. But what if the setup is capable of blasting Beethoven's Fifth through the audience, and yet the song in your presentation doesn't make a peep? Unless you're sure that you'll never have to run the presentation off anything except your own laptop, you need to set up your slideshow in a way that avoids this particular embarrassment. There are two ways to add sound to a PowerPoint presentation: You can link the audio, which tells PowerPoint to play a particular audio file, or you can embed the audio information inside the PowerPoint file itself. You might expect, in view of the advice I gave earlier about fonts, that the better approach is to embed the audio into your PowerPoint file. But that's not the case here because PowerPoint will let you embed audio that it may not be able to play. 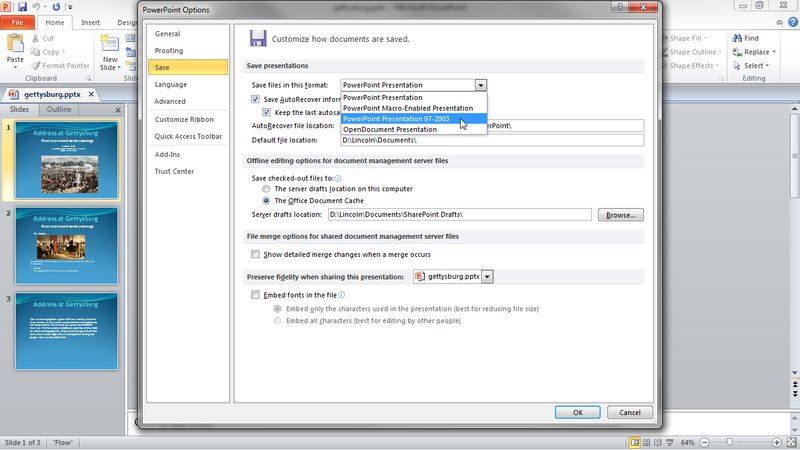 For instance, if you embed an MP3 file in PowerPoint 2010, you may not be able to play it in PowerPoint 2007. You tell PowerPoint 2010 to link to an audio file, rather than embed it, at the time you insert it. 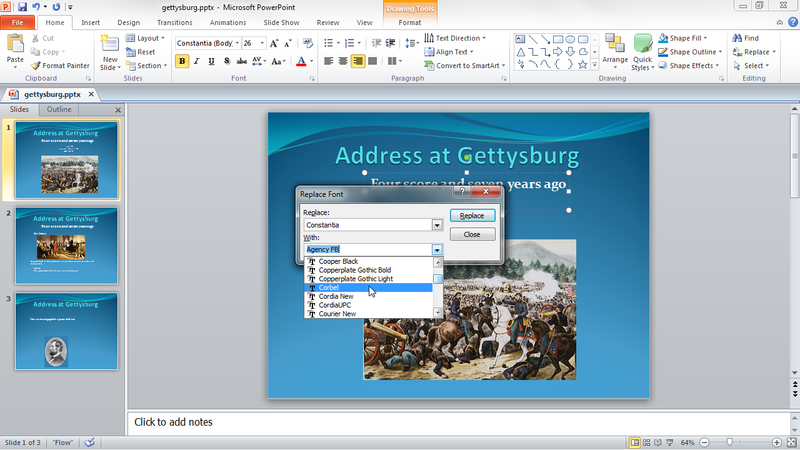 In PowerPoint 2007, click first the Office orb in the upper-left corner and then the PowerPoint Options button. Click Advanced in the left pane. Scroll down to the Save section. Make sure that the value of the 'Link sounds with file size greater than' option is smaller than the size of the smallest audio file you'll be using. There's no such setting in PowerPoint 2010. In the Insert Audio dialog box, select but don't double-click the file; then pull down the Insert menu near lower-right corner, and select Link to File. Take the folder, rather than the file, with you to your presentation. After you're done with your technically flawless presentation, you can go home and have a good night's sleep--assuming, of course, that everyone in the audience stayed awake during the presentation. Articles of Related Interest: For a review of non-PowerPoint presentation-software options available online, see "PowerPoint Alternatives: Presentation-Tool Showdown." For a Mac-centric discussion of how to improve a PowerPoint presentation, see "Five Favorite PowerPoint Tips." And for examples of what not to do under any circumstances, see our slideshow, "The World's Worst PowerPoint Presentations." Contributing Editor Lincoln Spector writes PC World's Answer Line column and blog, as well as the movie blog Bayflicks.net. Follow Lincoln on Twitter.